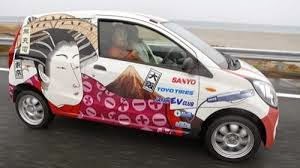 Mira EV has created a world record with completing 1000 km run on a single battery charge non-stop, powered by Sanyo’s lithium-ion battery systems This experiment took place on the world’s longest race course in Japan, in Shimotsuma. Organized by Japan Electric Vehicle Club, this long marathon driving was accomplished by a relay team of 17 auto-racers from a training school in Ibraki, Japan. Electric vehicles have long been handicapped for long-distance travel by the limited battery power. 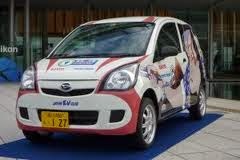 But now Sanyo’s lithium-ion battery technology has made it possible for Mira EV to travel 1003.184 km without a recharge. Traveling for 27.5 hours, at 40 km/h average speed, from May 22 to May 23, 2010, the trail run by Mira EV was powered by putting together 8320 cylindrical lithium-ion 18650-type batteries. Fame is nothing new to Mira EV. It had already once run for 555.6 km nonstop without recharging last November. This was acclaimed as world record in April. But now in May, beating its own record, almost doubling it, Mira EV has created a feat worthy enough to be recorded in Guinness World Record now, by traveling 1000 km on a single charge. Sanyo will continue with its work on lithium-ion battery. With Mira EV’s triumph, the future of electrical cars looks very bright. And Sanyo is still going strong on its mission of making a ‘low-carbon society’ possible and help in making zero-emission cars a reality.